Wheatgrass can either be grown at home or you can buy from health food store. You can drink the juice at juice bars (such as Jamba Juice, too expensive for a shot of wheatgrass juice!) or there are bottled juices and wheatgrass in powdered forms to be mixed with water. I grow wheatgrass at home regularly and being a vegetarian, I personally drink wheatgrass juice because of its high iron content in comparison to spinach, broccoli, etc. Update (19 Feb 2013): FAQ on wheatgrass growing procedures and wheatgrass juicing at home, answering reader's questions. There are several ways people begin the wheatgrass-growing process, but honestly I don’t see the need of buying special strainers, baby blanket kind of stuff, or fancy trays & containers. 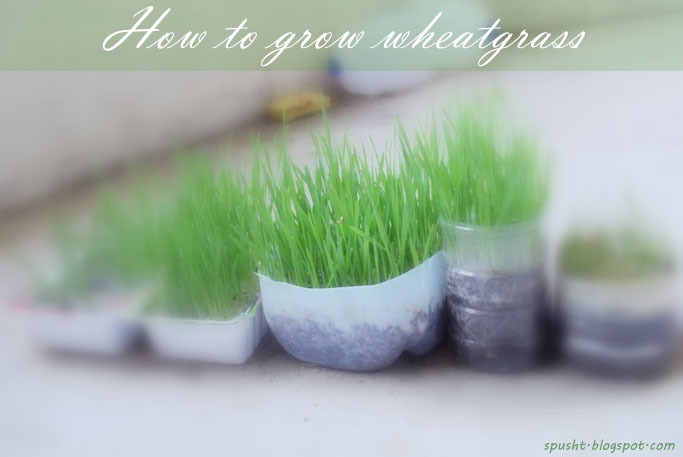 Through pictures below I will show you step-by-step procedure how I grow wheatgrass in simple ways and make wheatgrass juice at home. 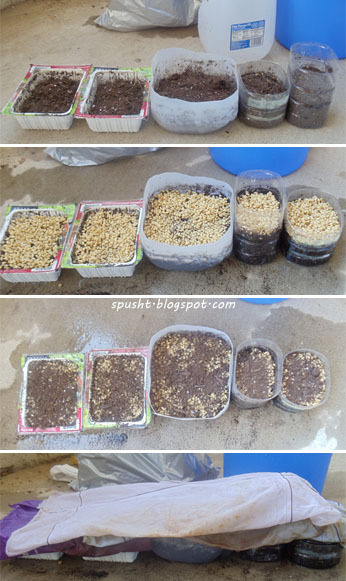 Since how many cups of seeds you must sow depends on the area you will be planting, I cannot give any measurements of seeds, water, soil and how much grass will grow out of them. But I hope the pictures will give you a slight idea of how it goes. You will need wheat grains, a container, tap water, sieve or small cloth. You can use pots or trays if you have, otherwise here’s a DIY: from what you will see in the pictures below – I have used a tofu container, a milk bottle & an oil bottle sliced in half (bottom portion), then poked knife randomly to create small openings for extra water to flow out. Wash wheat grains with cool tap water & soak in water for 12 hours or max for 24 hours & cover the container. Wheat starts to smell bad if you soak it any longer than that. The wheat grains will have increased in size after being soaked. I used about 1 cup wheat grains & 2 cups water. After 12 or 24 hours, drain the water & rinse them under running water once, then drain. (b) spread the wheat grains on a sieve or colander & cover with a damp cloth. Wheat should sprout in another 12 hours. Since wheatgrass is not heavy, small lightweight make-shift DIY pots as I mentioned above work just fine. Now fill it quarter way (or at least 1 inch) with soil, dampen it, and add a thin layer of sprouted wheat grains spreading it around until you see no soil underneath. Sometimes wheat grains do not grow into grass, so if you put few seeds there’s a possibility of getting small amount of wheatgrass. Then sprinkle very little soil on top, sprinkle some water, and cover with a damp cloth. After you keep the cloth on the pots for 2-3 days & dampen it by watering on top twice a day, you will see tiny greenish/whitish blades appearing out of the soil – here onward you don’t need to cover the pots. Continue to water the grass twice a day, just enough to moisten the soil. In a week the grass grows to about 5 inches, and within about 10 days it reaches 6-7 inches, this is when you’re ready to harvest. Cut the wheatgrass just above the white portion, wash well under water. If you have a Wheatgrass Juicer then you can put a bunch of grass in it green side down, pulp will emerge one side & filtered juice the other side. Otherwise, you can use a simple, regular kitchen blender like I do, put all the grass out of one pot inside the jar, add around 1-2 Tbsp water, and churn it. Using a sieve or tea strainer, press until thick dry pulp remains. Blend the pulp in the blender along with 2 Tbsp water again, strain the juice, then discard the thick pulp and you can have fresh, homemade, inexpensive and healthy wheatgrass shot at home. It’s best to drink fresh wheatgrass juice shot. What to do with the remaining white part & roots of wheatgrass & the soil? Remove soil from pot (on a newspaper, etc) & let it dry. Then discard the remains of wheatgrass & reuse the soil, proceed with Step 1. The cycle continues. Update (19 Feb 2013): You may also like to read the FAQ post - questions asked to me by readers about wheagrass growing and juicing at home and my answers. I hope this post on how to plant wheatgrass at home and how make wheatgrass drink is helpful to you. If you have any questions, feel free to ask. Disclaimer: The author of this blog has strived to be as accurate as possible in sharing the knowledge and the information in this blog post and the procedures are based on the author’s personal experience. This post is not intended to be a prescription, does not offer and is not meant to be a substitute for professional medical advice. The content has not been evaluated by US Food and Drug administration; therefore the reader assumes full responsibility and is urged to consult a qualified physician for any concerns before following the information given here. The author of this blog is not responsible for any adverse effects resulting from the use of any suggestions, preparations, or procedures in this blog post. Wow Nisha, What a mind blowing effort..and this is such healthy..I wish I could do this at my home..in between thanks for dropping by my space and leaving such beautiful comment..about the No Ghee Kesar kaji katli, it stays fresh for 2- 3 weeks outside at about 68F-70degrees F with excellent texture..then if it is still left you can put it in the fridge. - Thank you for the compliment & the clarification on Kaju Katli, Muskaan! I am definitely saving this page, a great post n very well explained! Awesome.. thanks for a detailed share.. will def try it.. hope i succeed..
Could you mix carrot juice in the Wheatgrass juice while drinking??? for better test..
Rajesh, I can't tell if the two juices together will cause any reaction, but some juice stores used to give a shot glass of orange juice to drink after gulping down a shot of wheatgrass juice... to make the bitter/bland taste on the tongue bearable. Hope that helps! You grow your own wheat grass!! How cool. I want to do that too! Pinning this post! This is great! My parents are completely pro- wheatgrass juice and ever since they started bringing it home, they made me drink it as well. Being a nutrition major, I had to overcome the taste and smell (which actually causes a lot of people to throw up) and started taking shots of it daily. However, when I did some reading and research, found out instead of drinking it everyday, it should be consumed every other day as every day it can actually be heavy on our digestive system. However, some benefits of wheatgrass (that I also personally experienced) are clearance of spots and pimples from the skin, efficient immune system, and it increases the functioning of the digestive system as well. Lastly, for women who suffer from stomach aches, this is a great remedy as it helps increase the iron content in the blood and which can be a cure to "monthly" stomach aches and cramps! 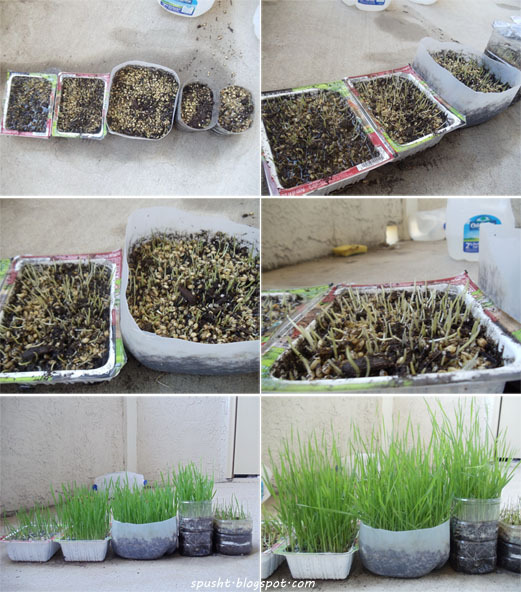 I have not come across such nice tutorial for growing wheatgrass at home which is so detailed and supported by wonderful and explaining pictures. After going through it any one can grow wheatgrass at home. I would like to add here that it is known that high rpm mixer grinder cause the oxidation of wheatgrass nutrients and heat generated during the juicing deactivates the enzymes. If you explore the right way of juicing wheatgrass you will find that it is recommended to use masticating wheatgrass juicer, which operates at low rpm and press out all the nutrients from the Wheatgrass. Your blog follower and readers can order it from our website addywheatgrass and we will deliver it to their home anywhere in India. Once again I appreciate your efforts to present the art of growing wheatgrass in so effective way. When i was prescribed This juice - the first thing i did is to know how to make this , on Google and came across ur blog. Thanks for such nice tutorial. If u can also please suggest few more points on which i have doubts ... (1) How much is the sufficient or recommended quantity to consume as "shot" ? (2) how to make is tasty so it can actually become drinkable? I'll be really happy if u can pls help. a) 2-3 oz small plastic disposable cup that you see in the last picture is the quantity of shot I have seen sold in shops and that I consume as a "shot." b) initially i used to drink some orange juice right after wheatgrass juice to get rid of the bitter taste. soon i got used to the taste of wheatgrass. you just have to take a quick shot & gulp it down, don't sip it :) or may be you can drink just a little water right after. but i don't mix anything with the wheatgrass juice to make it tasty.. Please make sure you get more information/follow advice from the doctor who prescribed wheatgrass juice to you. Thanks for your suggessions, but i have doubt, i.e. everyone can drink this wheat juice, is there any side effects. I'm not in a position to recommend and answer both questions. Few months back I gave a 60 year old uncle this juice in the morning, and by evening he felt he had to use the loo very often that day. Now, if that's because of side effects of this juice, or because he drank on an empty stomach, or because of any interference with his medicines, change of weather in new city, or his old age - I don't know. It was not a major side effect (and can't even say if it was because of juice), but I recommend you ask a physician if in any doubt. Hope that helps, Varun! The chlorophyll ,which is green blood of a plant and molecularly similar to human blood, content of this plant is more compared to other plant. Its use is effective in curing anemia. Good day! It was such a great pleasure to visit this personal blog and especially to read this blog post. Also I would like to ask you one thing that I am interested about. What is your attitude towards guest blogging? Wow, this was great! I am going to try this! Thanks for a wonderful post. I would love to try it soonest possible. Just a couple of questions. How do you buy wheat grains? It's just wheat grains? I am from Malaysia (humid, hot and wet combo). Can we grow it totally indoors or shaded area or out in the sun? Thanks for sharing. this post is wonderful and i'll try to do this at home..anything else that we can grow easily at home??? Welcome to Spusht and thanks for your kind words, Preeti. I haven't tried growing anything else yet, let me know if you do! Is it good to drink in empty stomach .i.e is early in the morning. i have noticed conditions of excessive burping and frequent urination upon drinking wheatgrass juice on empty stomach. i am not a physician so please consult an expert, but my suggestion would be to not drink on empty stomach. Hi! Great post! I started to drink frozen bars of wheatjuice but I wanna try fresh juice…I thought that use the blender it would be very simple way but I had been told that the juice cannot be in contact with metal (because it oxidizes chlorophyll) … so I have to buy a particular juicer (very expensive here in Argentina). What can you tell me about this? Maybe the metal reduces its properties but it is still worthy? Hi S, I have heard the same but I do not know the scientific reasons. I did not want to buy the wheatgrass juicer and I have been using the blender to make my juice all these years. May be it is as you said - metal reduces properties but still something better than nothing...or may be not. Please also see Shashi, CEO, Addy Wheatgrass's comment above..
hi thanks for the simple preparation of wheat grass juice and can u explain what is the way to make it juice after the grass grown . Did you read the juicing details in above post after scrolling halfway down? hi Nisha...great post!!! thank u fr sharing this post....I also want to share that wheatgrass juice is helpful in maintaining/increasing the haemoglobin level in blood. Hello, thank you so much for this information. I'm doing my first wheatgrass growth in my home. thank you so much! My seeds took longer than 12 hours to sprout, but they did sprout! I was like: Jeez, damn, don't tell me this won't work!!! O_o But it did, thank you! Is the wheatgrass supposed to be strong when you drink it? If its not strong you didn't grow it right, right? a) whether it is a strong taste of juice or not is subjective; b) not true. I think the soil and water do make a difference in the taste of wheatgrass juice. Back home, the juice tasted a little bitter to me than it does here in the US when I grow. Awesome Post nisha, i m planning to try it!!! No idea what is cat grass, but you just have to buy wheat grains (gehun, in hindi), try an Indian store. whitch type of seads we can use for wheat grass, is a common wheat in a store ? and i want to know whether my pregnant wife can take this wheatgrass juice or not? Any idea. I've been looking to making wheat grass from home and this post outlines everything so clearly. I'll let you know how i go and if i write up a post on it i'll sure to reference this page. I had been searching information on wheatgrass and happen to go through your blog. Liked it. Thanks Nisha for inspiring me to grow this at home. Nice post! Thanks for sharing.. awesome!